Buffet Burner™ is the most innovative universal electric chafer heater in the industry - the best alternative to sternos, wicked or canned fuel. 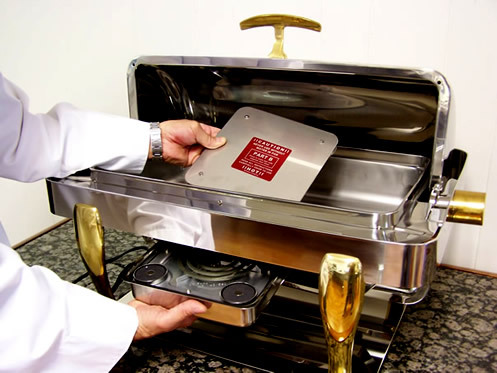 Buffet Burners™ heat your chafing dishes without the hazards of open flames or the unending costs that are associated with chafing fuel and save you BIG MONEY at the same time. If your buffet is suffering from unreliable heat resulting in food that is either cold, or dried out and over done, YOU HAVE FOUND A BETTER SOLUTION! The Buffet Burner is the only safe, reliable, interchangeable, eco-friendly, temperature controlled chafing dish heater in the industry today. We invite you to explore our website for the complete description of the amazing benefits. Reliable, Trustful Replica Watches for Sale. understand the demands of the modern day food service industry. This is the ultimate solution to the ongoing issues you are experiencing with your current method of chafing dish heat.